We don't fit the cookie cutter lifestyle so we made a plan to break free. So whatâ€™s the plan? Finish nursing school, get rid of all of our belongings, buy an RV and live full-time on the road. How? Well, one step at a time. There are so many questions. There's lots of great information out there from people already doing it and who have been doing it for years. I thought it'd be a good idea to document the journey from the beginning. The very beginning, planning and everything, all the way to making it happen. This what your RV Synergy Blog Ad will look like to visitors! Of course you will want to use keywords and ad targeting to get the most out of your ad campaign! So purchase an ad space today before there all gone! 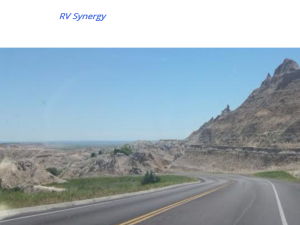 If you are the owner of RV Synergy, or someone who enjoys this blog why not upgrade it to a Featured Listing or Permanent Listing?